One argument concerning idle games is that the player's action is pointless. Yet it does contain some truth. The very nature of the idle game allows players to do nothing and still be rewarded, occasionally pressing a button to increase the reward, or the speed at which they are rewarded. Boiled down to its basic conceit, the exercise does sounds pointless. How much joy could someone really get from watching a number tick upwards over time? But I feel that despite - or even because of - such a basic mechanic, idle games have managed to become even more engaging than other genres of game. There's never any danger of failure through player skill, as failure is simply not possible, beyond a slower generation of in-game currency. Instead, players get a constant sense of accomplishment, encouraging them to play even more to see just how high their accomplishment can go. And with the basic mechanic being so simple, it gives developers more scope to expand, focusing on balancing the economy or adding ancillary tasks to keep players engaged. There's been a number of noteworth idle games in recent months – Futureplay's Farm Away! springs to mind as one of the best, and the godfather of the rewarded video ad monetisation technique. The very nature of the idle game allows players to do nothing and still be rewarded. And there are others – Bandai Namco's Tap my Katamari and Flaregame's Nonstop Knight – that I have now been playing for literal months, longer than any other mobile game in my library. Now, however, the genre has essentially been perfected by a small game that hasn't received much press attention, despite it being the very best of the idle genre: Egg, Inc. 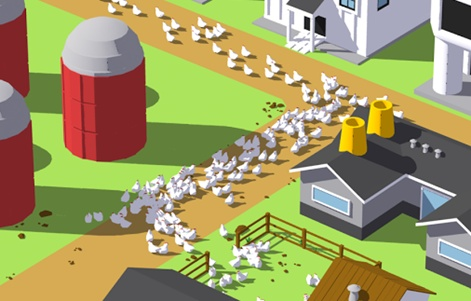 Released on 15 July 2016 by US indie Auxbrain, Inc, the game gives players a chicken farm that they have to grow, unlocking new eggs as they go. Again, it doesn't sound like the most engaging game out there, but Auxbrain has made so many clever design decisions that it elevates the game far above the competition. Most of its improvements are in its inventive approach to monetisation, which is heavily weighted to goodwill and a pleasant player experience than the hard sell. It makes heavy use of rewarded video ads, but alongside this rewards players at random with additional boxes of cash and golden eggs, the game's premium currency. Players don't necessarily need to watch the ads to get far in the game, thanks to its generosity, but you're encouraged to because the ads will give you just that little extra on top of what you're already given. You can also buy golden eggs as an IAP, but Auxbrain does something very clever here too, by allowing players to essentially set their own price on the IAP. It's possible to have a Piggy Bank with more eggs in it than the highest-priced IAP. While there are three IAPs with set numbers of eggs, a "Piggy Bank" is also available, which increases by one egg every time you buy a new building, vehicle, or piece of research. This doesn't sound like much to start, but before long, as players advance and reset their research progress, the amount of eggs pouring into the Piggy Bank increases dramatically. It's therefore possible to have a Piggy Bank with more eggs in it than the highest-priced IAP, giving the player a sense of getting one over the developer, and potentially encouraging them to spend the $3 to smash the Piggy Bank, get the golden eggs, and start the whole process again. And, of course, players are being shown rewarded video ads the whole time they're building up to making that purchase. It's beautifully subtle, tapping into a competitive spirit of the player in a them vs the developer kind of way, but which ultimately leads to the developer winning. One problem idle games face is trying to avoid players staying away for long periods of time and just accruing money when they're gone. Some games have invisible caps to deal with this problem. Farm Away! never explicitly states that your offline earnings can be capped in any way, but if you keep track of the totals during infrequent sessions, it's fairly obvious that you're being levelled off at a certain point. Nonstop Knight handles this well by stopping your knight from progressing when it reaches a boss, limiting access to more gold and better weaponry, and demanding players return to beat the boss and progress. But that only works because of the game's distinct progression mechanic – something a game like Egg, Inc. doesn't have. What Egg, Inc. does instead is explicitly tell players they'll be capped off, before giving them the option to buy more offline time with real money, or improve their offline takings by levelling up the farm with golden eggs. It's a little like FarmVille's appointment mechanic, but without the wither penalty for not returning. You don't lose anything, but you also stop earning. It's refreshing that the game is so open about its limits, and again goes some way to generating goodwill between player and developer. And that's ultimately what Egg, Inc. does brilliantly. It encourages the player to keep playing, easing them along with constant rewards, while also gently nudging them towards IAPs and rewarded video ads. What Egg, Inc. does brilliantly, it encourages the player to keep playing. It's a slightly risky monetisation strategy, and faintly reminiscent of the JRPG model found in titles like Tales of LINK and Final Fantasy: Brave Exvius, in that it focuses much more on player experience than encouraging them to part with their money. But the better engaged a player is, the more likely they are to spend, and the more likely they are to spend repeatedly after that first purchase. In a landscape where so few players actually pay for IAPs, any method that can focus on retention and player comfort instead of trying to make a quick buck is surely the way forward. And Egg, Inc., especially with its incremental Piggy Bank IAP, is the gold standard on how to do this right, without overcomplicating gameplay or even requiring a social aspect to the game. Their Piggybank is awesome design ! Talking about Idle/Clicker , i think Abyssrium can topple Egg Inc regarding gameplay and monetization design. More appeal to spend than Egg inc , but this is very subjective opinion as i see nothing visually changed on Egg Inc when we going advanced. While on AbyssRium you can have very appeal graphical changed when you are going advance day through day. Great article about the game and monetization design. I love the piggy bank idea and their decision to not make it abundantly clear how the piggy bank accrues more eggs. I am surprised their was not a "Yes" to capping the size of the piggy bank. I've considered buying it but just end up getting that feeling of "Nah, I'll save it for a rainy day." I am not sure when I will buy it, but I sort of feel like I've moved on from the game already to Tricky Tribes' Tinker Island. It is a whole different game, but still has the core mechanics of a idle game and resource manager. Somehow they got stingy ole me to buy the promoted IAP on my first day of playing it. The value was just too high and I was already enjoying myself.